You will definitely agree that selling a house is really a difficult process. Obviously, home sellers face a lot of challenges along the way. If you decide to sell your property, you will probably think about contacting a realtor in order to put your property on the market. This is what a traditional way of selling is all about. However, this method can take too much time and effort. Plus, it can be too expensive for you to sell a property with a real estate agent. Selling your house to a real estate investor is another option that you need to consider. Dealing with an investor offers a great number of advantages to homeowners who want to sell their property fast and easy. So, let’s outline the main benefits of cooperating with a reputable real estate investor. If you are not ready to wait up to 6 months till a real estate agent helps you find a buyer, then selling to an investor is the right option for you. The only thing you have to do is to tell an investor that you would like to sell your property. Then, he/she will come to you and value your property. As a result, you will have a fair cash offer in your hand within 24 – 48 hours. Actually, you don’t need to spend your time and money on fixing problems. An investor is likely to agree to buy a house without repairs. Once you agree to accept the offer, you can choose the date to close the deal. Keep in mind that investors buy properties fast. It usually takes a seller no more than 7 days to complete the deal. Buyers traditionally want to purchase properties in good condition. This means your house will undergo an inspection. If an inspector finds some problems, you will have to fix them prior to selling the house. However, if you don’t want to pay for the repairs, you should definitely think about selling your property to a real estate investor. It’s important to know that many investors agree to buy houses in “as-is” condition. Investors purchase properties with foundation problems, with a bad roof and other types of problems. Whatever the problems you have in your house, most likely an investor will agree to buy your property. Real estate investors even don’t ask homeowners to clean the house before leaving it. When you choose to list your property with a real estate agent, you will have to pay a commission – about 6 % of your home’s selling price. If, for example, you want to sell your home for $300,000, then you will have to pay $18,000 to your realtor. Obviously, this is a huge sum of money. Of course, you can try to find a buyer by yourself to avoid paying this commission. However, finding a buyer on your own is no easy task. You will have to do a market research and develop your own marketing strategy to achieve this goal. This is really a time-consuming procedure. If you have a daily job or a business to run, then you will hardly be able to sell your property without a real estate agent. So, selling your home to an investor remains the best option for you. But, you don’t have to pay any commissions and fees if you choose to sell your home to a real estate investor. This is really a stressful situation when you are behind on your mortgage payments. If this situation happens to you, you’ll have to act fast and do everything you can to avoid foreclosure. Otherwise, you will lose your property. In addition, foreclosure will have a huge negative impact on your credit score. That means that you’ll find it hard to get a new loan and buy another property in the future. To avoid this, you may apply for a loan modification. But what if your lender doesn’t approve it? In this case, you will lose your property. And of course, selling a property to an investor in this situation is the right thing to do. A real estate investor will take over your mortgage payments and this will help you prevent foreclosure from happening. Let’s assume that you need to sell an inherited house. You should know that it may take you too much time to sell an inherited property with (or without) a real estate agent. However, the longer your house remains unoccupied – the worse. The house can get vandalized because there is no one to prevent these kinds of things from happening. As a result, the house will lose its value and it will be more difficult for you to find a buyer and sell it at a good price. A real estate investor will buy your property within a short period of time. You will not have to worry about repairing and cleaning the house as well. In fact, making your house look beautiful doesn’t guarantee a successful deal. Your buyer may experience some financial problems and the deal will be postponed. In this case, you will waste your time. A reliable real estate investor aims to make your life easier. If you want to sell the unwanted property fast and avoid stress, investors are always here to help. Property market is rapidly growing. So, it won’t be a tough task for you to find a reliable real estate investor in your area. An investor will evaluate your property’s worth first and then make a cash offer that you are likely to accept. 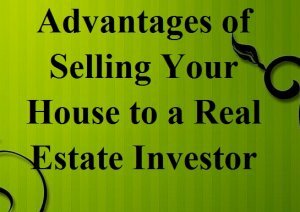 No matter why you are going to sell your house, selling to a real estate investor is always a good option. Investors have enough funds to buy your property right away. If you choose to sell your home to a real estate investor, you can be sure that this process will be really fast and easy. Remember, real estate investors are ready to buy your property for cash. So, you will get the money on the day you decide to close the deal! Should I Sell My House to an Investor?